The special counsel’s indictment shows that the minority vote wasn’t suppressed only by restrictive state policies. Russian nationals tried to suppress minority turnout in the 2016 election and spread false claims about voter fraud in an effort to harm Hillary Clinton’s presidential campaign and help Donald Trump, according to an indictment announced today by the Justice Department. 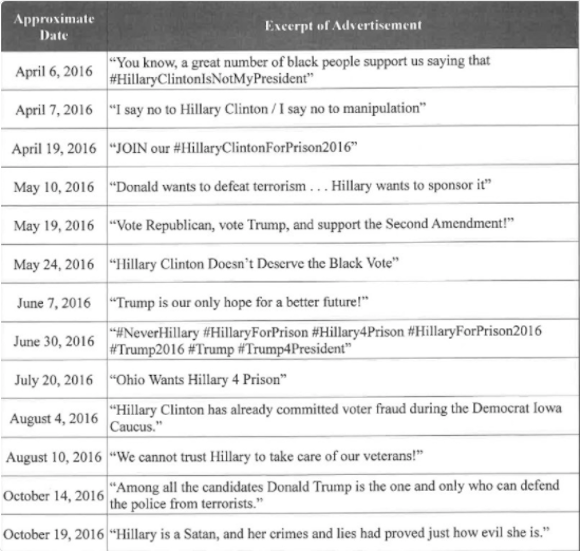 Starting in or around the summer of 2016, Defendants and their co-conspirators also began to promote allegations of voter fraud by the Democratic Party through their fictitious U.S. personas and groups on social media. Defendants and their co-conspirators purchased advertisements on Facebook to further promote the allegations. b. On or about August 11, 2016, Defendants and their co-conspirators posted that allegations of voter fraud were being investigated in North Carolina on the Twitter account @TEN_GOP. Republicans used many of these same tactics during the presidential campaign, with Trump repeatedly warning of mass voter fraud and Republican-controlled states like Wisconsin passing restrictive voting laws that disproportionately kept minority voters from the polls, as Mother Jones has reported. The Department of Homeland Security has already stated that the Russians tried to probe voter registration lists in 21 states during the 2016 campaign and breached voter registration lists in Illinois and Arizona, though they were unsuccessful in changing any votes, according to DHS.